The chai cupcake (only offered on Fridays) with spiced buttercream is probably my favorite, followed by the classic standard offerings of dark chocolate with dark chocolate sprinkles (you need to get it with these sprinkles, I insist) and red velvet (that cream cheese frosting is amazing). Ladurée has a vanilla (vanille) macaron that will knock your socks off -- it is by far the truest tasting vanilla-flavored macaron that Marcus and I have had in our macaron madness of tastings. The lemon (citron) is tart and refreshing, but just enough so that it's not overly sour. The caramel (caramel à la fleur de sel) is stellar, and the chocolate (chocolat) has a creamy, bittersweet ganache at its center. Last but not least, the pistachio (pistache) is, simply put, poetic and dreamy, with its pleasant playfulness dancing on your palate with each and every bite. 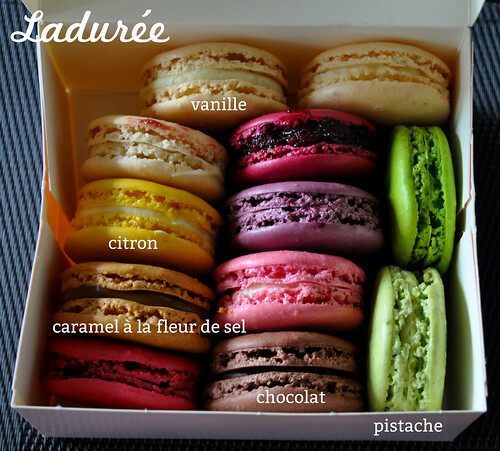 While Ladurée is the place to go for more "classically driven" (both in regards to texture and flavor) French macarons (the everpresent line out the shop's French doors is a testament to this), La Maison du Macaron holds a special place in our hearts. Our first visit to a macaron shop (i.e., one that offers macarons) together as a couple was to this very spot (formerly known to us as Madeleine Patisserie). It was also, coincidentally enough, my first time (as well as Marcus's) ever having these delicious meringue delights -- who knew it would add to an obsessive mission of ours to find the best ones in New York City! Pepsi-lime still remains Marcus's overall favorite. As we've only seen it (and had it) once at La Maison, it is almost as if it disappeared into the abyss as an urban myth. We swear it existed at some point, hoping that it'll make a gallant return to the patisserie's daily jewel box of macarons. Just to catalog: Cointreau, pink champagne, lychee rose, pistachio-lemon, Nutella, mango, kir royale, raspberry, and rum-cola. 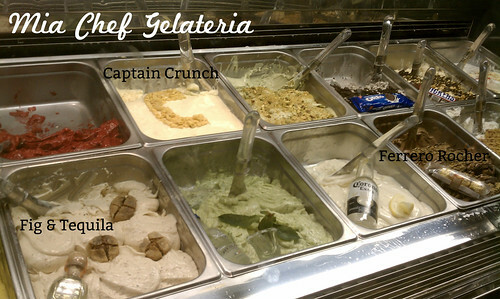 Now if you're jonesing for some gelato, I know the exact place you should visit: Mia Chef Gelateria over in Kips Bay. Like La Maison du Macaron with its eccentrically-flavored macarons, Mia Chef does the same with gelato. Offering classics like pistachio, stracciatella, Dutch chocolaate, etc., Mia Chef balances these out with some unconventional flavors (almost twists on traditional gelato ones) with the popular Cinnamon Toast Crunch and Captain Crunch as well as fig & tequila (the gelateria's take on rum raisin), strawberry margarita, and Ferrero Rocher (a twist on Nutella and hazelnut). 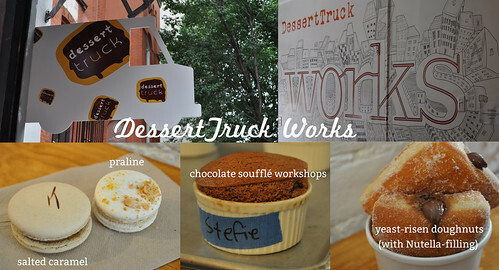 For some fun, pretty affordable gourmet treats, DessertTruck Works is your best bet. Among the various desserts offered by DT Works, our favorites are its assortment of French macarons (specifically, salted caramel and praline), the warm molten chocolate cake, and the yeast-risen doughnuts with Nutella filling. In conjunction with these awesome desserts, DT Works offers baking workshops for French macarons and chocolate soufflés, which Marcus and I found to be enjoyable, informative, and easy to follow -- highly recommend to sign up for these workshops if you're hoping to learn how to attempt at creating these from scratch! Now title for best innovative dessert combination goes to popbar in the West Village, for combining popsicles and gelato in a scrumptious dessert. Pistachio Premium is a wonderful choice -- especially for the freshly crushed pistachios and chocolate -- among its treasure trove of colorful offerings. Not only do you get the wonderful creaminess from the gelato, but also the frozen goodness from a popsicle.